As former President George H.W. Bush left the White House in January 1993, he left a note for his successor, former President Bill Clinton, wishing him much success in office. “I wish you great happiness here,” Bush wrote. Clinton has now responded decades later with a Washington Post op-ed paying tribute to Bush, who passed away Friday at the age of 94. “No words of mine or others can better reveal the heart of who he was than those he wrote himself,” Clinton wrote in reference to Bush's letter. “He was an honorable, gracious and decent man who believed in the United States, our Constitution, our institutions and our shared future. Clinton recalled how they got to know each other better when he was asked to help spearhead relief efforts after the Indian Ocean tsunami in 2004 and after Hurricane Katrina devastated New Orleans in 2005. "When we met with children who lost their parents in the tsunami, he was moved almost to tears when they gave us drawings they'd made to capture their pain and slow recovery in grief counseling. When we were asked to speak together at Tulane's graduation in 2006, I saw his genuine feeling for the students, many of whom had suffered in the flooding of New Orleans, and others who had shown heroism and love in caring for their neighbors,” Clinton shared. Clinton also noted Bush’s continuous optimism and love for adventure, including the fact that he famously learned how to skydive at age 75, even after being "shot out of the sky" and the sole survivor of his crew during his time as a pilot in the Navy. “We should all give thanks for George H.W. 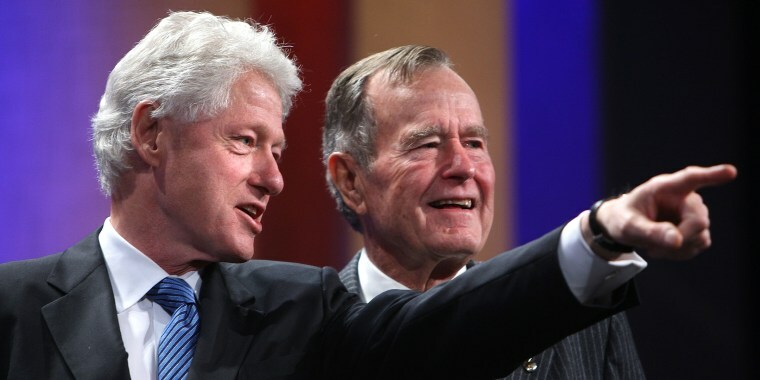 Bush's long, good life and honor it by searching, as he always did, for the most American way forward,” Clinton concluded. Bush's passing was announced Friday night in a statement by his son, former President George W. Bush. "George H.W. Bush was a man of the highest character and the best dad a son or daughter could ask for. The entire Bush family is deeply grateful for 41's life and love, for the compassion of those who have cared and prayed for Dad, and for the condolences of our friends and fellow citizens," the younger Bush wrote.